Recovering from a stroke is an arduous process, but thanks to a group of UW Ph.D. students, virtual reality video games could transform the way patients experience therapy. 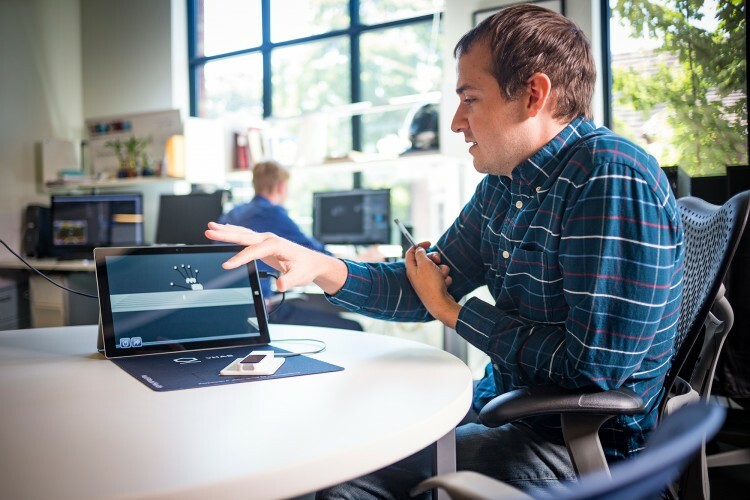 Back in late 2014, we wrote about a group of UW students who won the Center for Sensorimotor Neural Engineering’s Tech Sandbox Competition, now known as the Neural Engineering Tech Studio. Fresh off their win, they were turning their idea from the competition, vHAB (or virtual reality-focused rehabilitation therapy) into a viable product and beginning to navigate the startup world. Fast-forward to today, and the group — now MultiModal Health Inc. — is still sailing full-steam ahead. With help from the UW’s CoMotion, in 2015 they successfully spun-off their startup and licensed the vHAB technology. They’ve also presented vHAB at the American Occupational Therapy Association’s annual conference, and completed the Jones + Foster Accelerator, a program at the Foster School of Business that helps student-led startups get off the ground. Up next? The group began initial market testing, with their first pilot customer providing feedback on vHAB. And thanks to funding from sources including the Jones + Foster Accelerator, resources and incubation space from the CSNE, and new partnerships in the pipeline, MultiModal Health will continue to explore options for their pioneering product. Learn more about MultiModal Health’s journey on their website, check out an article in GeekWire and read our original story below. After winning the Center for Sensorimotor Neural Engineering’s Tech Sandbox Competition, four students are collaborating with partners across the UW to get their innovative project out of the lab and into the lives of stroke patients undergoing rehabilitation. What is the Tech Sandbox? Completing a challenging level in a video game can feel truly satisfying. Whether a tough “boss” is defeated or a racecourse is conquered, that sense of accomplishment pushes players to take on the next level of the game. To patients undergoing stroke and traumatic injury rehabilitation, this motivation, combined with the immersive aspect of virtual reality, could also serve as encouragement during a long and slow recovery process. Since January, UW students Tyler Libey, Brian Mogen and Dimitrios Gklezakos and Technology Commercialization fellow Lars Crawford have worked to make this idea a reality. The students are the team behind vHAB, or “virtual rehabilitation,” a device featuring a series of video games that double as rehabilitative exercises. vHAB began as an entry in the Center for Sensorimotor Neural Engineering’s (CSNE) 2014 Tech Sandbox Competition. Tyler and Brian, doctoral students in bioengineering, had joined forces with Lars, then an undergraduate studying neurobiology, to create a working neural engineering prototype. 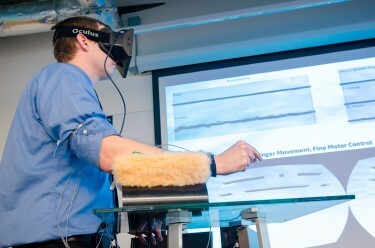 With experience in motion-sensing technology already under their belts, the team decided to put their skills to the test by fashioning a device that could help people with muscle disorders or injuries. After seeking guidance from Dr. Jared Olson, who specializes in rehabilitation medicine at Harborview Medical Center, Tyler and Brian shadowed physicians as they worked with stroke patients. Witnessing the struggles these patients experienced, the team was inspired to turn their technology into something that could help make the recovery process much easier. Using an Oculus Rift virtual reality headset and a Leap Motion device — which detects and measures hand movements — the team developed a series of games emulating the therapy tasks they observed at Harborview. One game requires players to place ingredients on a pizza, while another has them brush a giant’s teeth. As each level is completed, the tasks increase in difficulty, all while motivating patients by tracking how far they have come in improving muscle movement.